Lucky Strike After the Show Ad 1914 This is a December 1914 advertisement It is a nice black and white ad from The American Tobacco Co makers of Lucky Strike cigarettes. Pictures some well-dressed folks (please note vintage clothing). Gentleman in the foreground is holding a pack of Lucky Strikes It reads, After the show, A relishable cigarette, Rolled from fresh rich Lucky Strike, Will Chirk you up, Put savor into your supper, Tang into your tango With nice graphics from an early magazine.. In mint condition. Photo is taken through plastic and may show wrinkles or crookedness that is not in the ad. This magazine tear sheet measures6 1/2"" wide by 10"" tall. 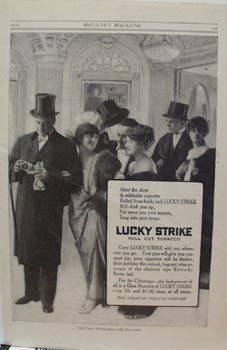 Items Similar To "Lucky Strike After the Show Ad 1914"